Mr. Tee is a Tv presenter of KBC Angaza show and gospel rap artiste. He is among the few Kenyan gospel celebrities who have managed to stay away from controversies and drama. This year, he shocked many people when he decided to tie the knot with his long time girlfriend Wahito Kabi. He had managed to keep his relationship low key till when he decided to propose and it went viral. And their love story continues. He opened up about his relationship with his wife. 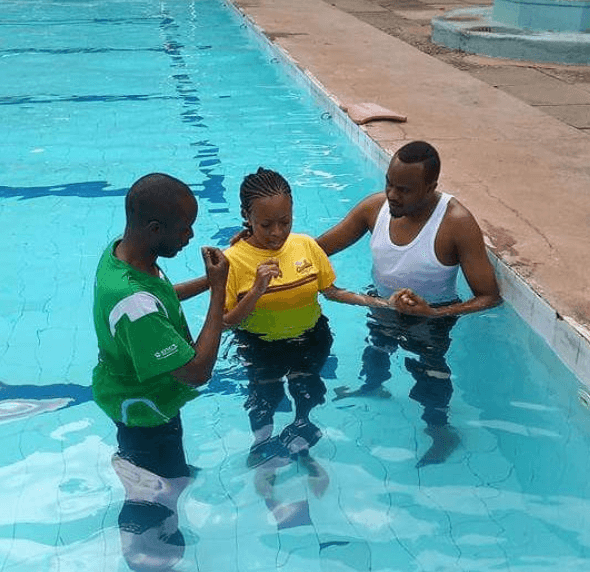 He posted this photo baptizing his wife. God gives us seeds to plant, water prune and tend to. Many people are looking for a complete woman. You better look for a woman you will complete not compete. I was also a seed to her. Most people think romantic moments are coffee dates, holiday trips and special moments that you spend together. That’s should be your life style and those should be the basic moments. I led my wife to Christ, I baptised her, I discipled her and am still doing it. am a proud husband, priest and Bff to her. One of my romantic moments is when I baptised her as her priest and husband to be then. A real man sets Godly footprints for her woman to walk on. With time I know she will be thundering with mysteries and prophetic tongues.